The Europeans mock us. The Koreans boast a claim they are the world’s most wired country. Finland is bringing broadband to reindeer. The Organization for Economic Cooperation and Development (OECD) published in their 2009 statistics the U.S. now ranks 15th among the group’s 30 member countries for broadband subscriptions. This is down from 12th in their previous study. No way! 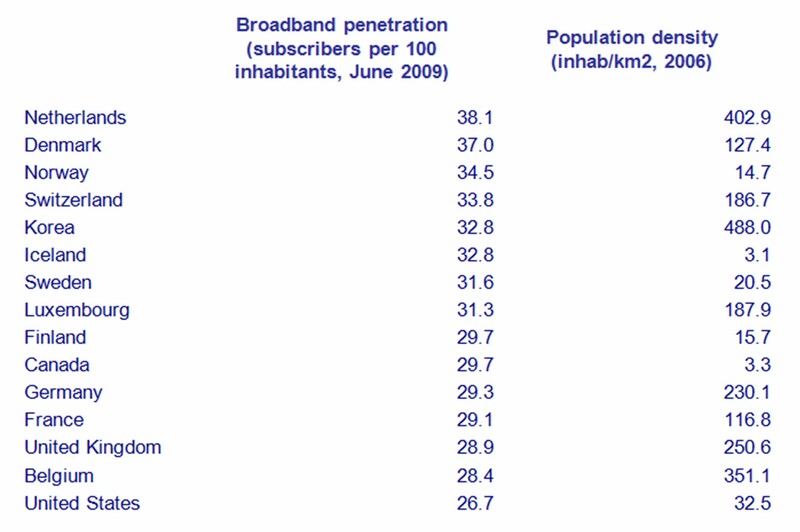 Is the United States actually that far behind the world in broadband deployment? Should the home of Cisco Systems, Brocade, IBM, and HP hang our heads in shame at our inability to deliver a world class communications infrastructure? Well, we shouldn’t hang our heads in shame, however there is ample opportunity to further develop our national broadband infrastructure. Looking at the following table you can easily see the US has a huge landmass, with much lower than Euro-Asian average population density. Kudos to Canada and the Nordic countries, although let’s be honest – 90% of Canada’s population is within 100km of the US border, and most of that is in cities. Same for the Nordics, and Iceland is not what you would normally refer to as a large landmass. Now let’s brush off the “feel good” paragraph and get back to the real issue. Making broadband accessible to every person in the United States who wants or needs access to network-enabled applications and resources. In a country as large as the US, the long distance carriers and wholesale cable providers deliver infrastructure that connects New York to Los Angeles, and all others in between with high performance cable infrastructure. All other service providers deliver either a specific service to regional markets or end users. Some may contribute to “overlay” networks which provide a higher level of product or service to users throughout the market, such as Internet services, telephone services, television and “triple-play” (video, voice, Internet). Sounds Easy? Just connect all this stuff together and the USA will be back on top of the broadband podium with a gold medal. But…. The US is an open, competitive market. As all the US carriers (with the exception of some utilities) are privately (not government) owned, the objective is to make money for shareholders. This means cooperation with other companies is a mere short-term convenience, with no incentive for investing in any infrastructure that does not meet a business plan for satisfying the demands of investors. Altruism or working for the common good is reduced to marketing hype – and has very little basis in the reality of America’s communications infrastructure. Maybe stimulus money or additional tax credits for companies to cooperate and meet national objectives? Unlikely, as most states are already suffering a great deal from the loss of telephone tax revenues (you’ve got to love VoIP), and to get into the stimulus business you will need to means to hire a legion of lawyers, lobbyists, and prepare for a long time horizon to see any support. That narrows it down to the ILECs, long distance carriers, and wholesalers. Same applies for money available through the Broadband Initiatives Program (BIP) and the NTIA Broadband Technology Opportunities Program (BTOP). Thus, my favorite little town of Baudette(Minnesota) is not likely to be a really high priority for any serious infrastructure development. Yes, companies like Time Warner have delivered cable TV and cable modems to the market, however if you do not have access to the cable (which pretty much follows the state highways, and does not venture too far off the asphalt), chances are you will not be receiving multiple streams of HD video any time soon. This also begs the question – if people really want to be wired, maybe they will migrate closer to cities which offer much more robust urban infrastructure, and those who want to spend their life fishing can do so in peace? Good, as long as they do not choose to reproduce, in which case the children deserve to have the same access to global information ands communications technology needed to ensure they are competitive with children in Korea and Amsterdam. 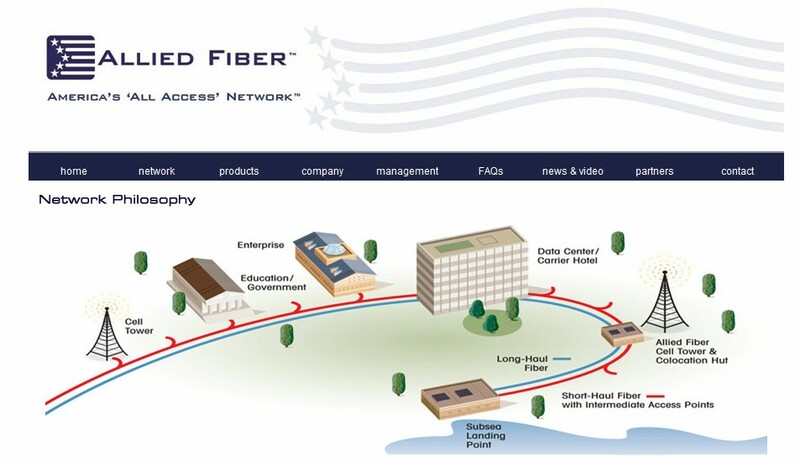 In the 1990s companies such as Level 3 Communications used marketing taglines with the theme “bandwidth is like water,” and fiber infrastructure should be considered “big, fat, dumb pipes.” If the philosophy had survived investors, Wall Street analysts, and the desire to increase cash flow by adding higher level value added services (such as voice, Internet, TV, etc), the US might have a very high performance physical infrastructure in place that served as a neutral conduit for regional and local carriers and service providers to deliver broadband closer to the edge – or end users. Companies such as Allied Fiber hope to bring that idea back to reality, providing the United States and Canada a very high performance, cost-effective trans-continental backbone allowing regional and local service providers and easy way to bring their edge resources to the North American “cloud.” Wireless companies can focus on delivering transmission to end users from the tower, and Allied Fiber will connect towers, regional networks, access networks, and value-added service networks (such as Internet providers) on a national scale. One bright spot in the discussion is broadband wireless. The US carriers are pushing deployment of LTE and 4G, further incorporating broadband support via emerging technologies such as MIMO (Multiple In – Multiple Out) antennas which bring wireless up to the Gigabit/second level on individual end-user devices. This will reduce the need for fiber optic or high speed cable infrastructure deployment into both rural and urban areas with obsolete or decrepit building/street infrastructure. All new communications technologies being delivered by Verizon use Internet Protocols, including wireless telephone service, and incorporating IPv6 into the basic network. A combination of their FiOS (fiber optic to the home) product and high performance LTE=>4G wireless deployments will make up a lot of ground in the US. Add a national high performance backbone network connecting the whole North American mess via Allied Fiber, and the US has a pretty good chance at jumping into the top 5 in OECDs broadband deployment listing. 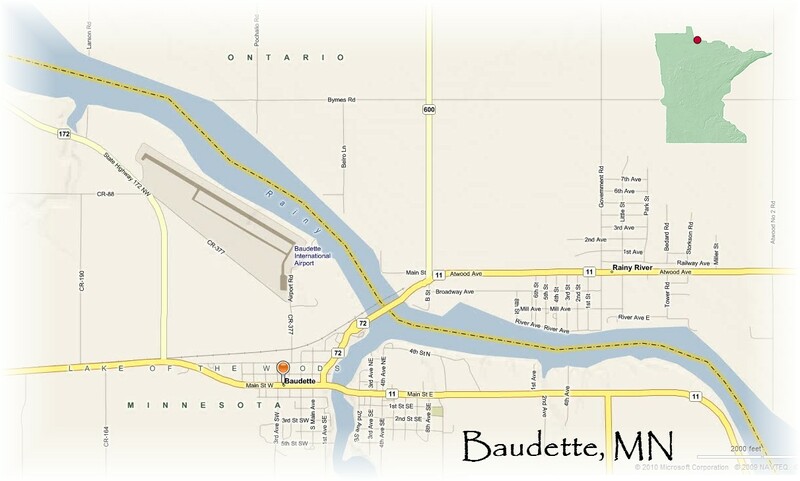 And Baudette’s culture and global presence is preserved.